Every fall, football teams around the United States flood fields and screens around the world. Week after week, they use their combined efforts to try to push the ball into their opponent’s territory. During each drive, every member of the team has a clearly defined role to play, and they all need to do their jobs consistently to score. All the players need to work as a unit, but the quarterback has an outsized impact on the team’s success (or failure). Like football, content marketing is a team sport. Measurement, distribution, and technology all have to play their roles well and consistently to deliver wins week after week. But high-quality content creation has to lead the charge. Like the quarterback on a football team, the ability to create outstanding content will have a disproportionate effect on content marketing’s success (or failure). 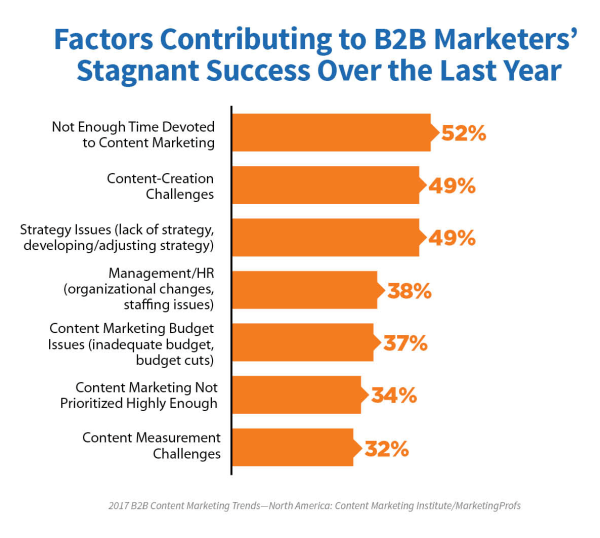 In fact, 85% of B2B marketers who said they were more successful in 2016 than the previous year attribute their success to better content creation, according to CMI’s B2B Content Marketing: 2017 Benchmarks, Budgets and Trends—North America. Of course, that’s easier said than done. Finding time to produce the necessary volume of content while maintaining quality standards can sometimes feel more difficult than pulling off a Hail Mary pass to win in the final seconds of a football game. 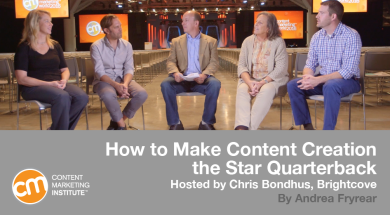 We asked a roundtable of major players in B2B content for some of their best plays to help content marketers make more time for the content that wins customers. We include highlights of what they had to say and share their more thorough comments in the video. This roundtable was led by Chris Bondhus, senior director of demand generation for Brightcove, and featured Ardath Albee, B2B marketing strategist with Marketing Interactions and author of Digital Relevance; Carla Johnson, president of Type A Communications and co-author of Experiences, the 7th Era of Marketing; Skyler Moss, director of digital marketing for HCSS; and Dusty DiMercurio, content marketing and strategy, AutoDesk. As we saw, content marketers who say their team is crossing the goal line more often cite content creation (higher quality content and/or more efficient processes) as the game changer. A lack of time and content creation challenges also undermined the efforts of content marketers who felt they scored fewer content-related touchdowns during the past year. Since adding hours into the day isn’t a possibility, and asking content marketers to put in more hours would be more than even the most intense football coach would ask, we need to figure out how to make time to create the content that matters. Ardath doesn’t believe that a lack of time has to bring a content team to its knees. Some teams, she says, get fixated on posting to the blog five times a day, releasing a newsletter on Tuesday, writing a white paper, and running a webinar without stopping to consider how these pieces relate to larger strategic objectives. What strategy is it feeding? What story is it telling that (is) actually helping their buyers buy from them? I would argue that it’s a mismanagement of time because they have a misconception about what content marketing is in its most effective form. It’s not more, it’s better. Consistency and quality are far more impactful than sheer volume when it comes to content marketing, so don’t hit “publish” just so you can say you produced a certain number of pieces each week. Instead, document your content marketing strategy and make sure every single thing you release is contributing to making that strategy work. A content marketing strategy helps you identify core objectives that your content needs to achieve, but you also have to decide what to do first. Trying to serve every member of your audience across every stage of the buying journey is like asking a football team to run simultaneously every play in the playbook. Everyone runs around a lot, but there’s little cohesive effort (and certainly no touchdowns). Dusty reminds us that each and every phase of the journey doesn’t need the same level of attention all the time. He advises his content creators to, “figure out where things are getting stuck (in the buying process) and figure out what those pivotal pieces of content are you need to unstick” your audience. Ultimately, it’s about being thoughtful and strategic about where you apply your energy. Call the play and run it before you start the next drive. What Should Your Content Marketing Priorities Be in 2016? Sticking to strategy and focusing on priorities are excellent ideas in theory, but interrupt-driven marketing teams have struggled with achieving these goals for years. Fortunately, our panelists (and marketers everywhere) are coming to a solution: running your content team based on Agile principles. Skyler Moss shared how his team at HCSS has increased its content production speed by taking an Agile approach, and Carla praised Agile’s ability to keep a team focused on its priorities by allowing them to say, “no” to outside requests. Increasing visibility and transparency. If other teams and departments know what your content creators are working on, it’s clear what has to be put on hold when they throw unplanned work into the mix at the last minute. Breaking projects into manageable pieces. Each piece has value as a stand-alone item, while also building toward a larger strategic vision. By releasing small pieces of content consistently, you get more done, avoid rework when priorities change, and increase your team’s overall output. Maintaining a sustainable pace. This is a core tenet of the Agile manifesto, and it should be core to content teams too. Creative professionals can’t produce their best work if they’re stretched to the limit all day, every day. Sustainability matters for both business results and personal happiness. Football teams are sometimes unlucky in their quarterbacks, and it can make for a long season. Content teams, on the other hand, can take control of their content quality and turn things around. Choose strategy over volume. Document your content marketing strategy then make sure that each piece of content relates clearly to your larger objective. Prioritize your work ruthlessly. Refuse the “do-it-all, right-now” approach and focus on content that can make an impact. Use Agile principles to protect your team. Break content into valuable, yet manageable chunks, and say no to work that derails your team’s focus without adding immediate value.